Each season brings its own wonders, and there is much to enjoy at this time of year. The weather has been changeable here, but often warm enough to work in the garden or just sit with a cup of tea and enjoy the peonies and celandines that are flowering right now. Today is my daughter’s 15th birthday, so we had a special breakfast of warm bagels, frothy coffee and cloudy apple juice while she opened her presents this morning. She received a lot of books as she reads almost as much as I do, and I have planned a trip to Brighton this summer – our first time away for several years. Then my youngest son’s birthday is on Saturday and he will be 18! I can barely believe that I will have 2 adult children. (I’m still struggling to be a grown up myself). I am relieved to have finished my last assignment of this school year. Apart from an exam in a couple of weeks (best not think about that), there are no more essays until October. I do, strangely perhaps, enjoy writing essays. But at the same time, they do tend to take over your life, so I am glad of the break. I will have more time to paint and do other non-course related things for a few months. Has anyone watched the new Netflix series ‘Anne with an E’? Emily and I have finished all the episodes and thought it was absolutely wonderful – the cast and writing is superb and the opening credit sequence is one of my most favourite ever. I do wish there were more uplifting films and shows like this available. As evident in the unspeakable events in Manchester last night, there is enough horrific violence and heartache in the world without being constantly bombarded with it in our entertainment. Years ago when I first started blogging, I did so because I had started to learn to draw and paint and I wanted to share my attempts as a way to encourage myself to keep going as well as sharing some of the beauty of nature as much as my beginning efforts allowed. I’ve kind of veered away from making art over the last year, and I’ve noticed my life is the lesser for it. I miss collecting small treasures of leaves, acorns and stones from the garden or while walking and trying to present what I see with paper, line, shape, colour. Lately I’ve been returning to the practice. I have some beautiful books on botanical and natural history illustration by Rosie Martin that I am working through. It takes continual effort to not get frustrated with my lack of skill and to focus on the process, but I’m getting there. I intend to return to sharing more of my drawings and paintings here, along with a few words in the form of a nature journal or a poem or short story. I’d like to keep notes on the weather, wildlife, flora, and other aspects of the natural world. There is so much happening that we miss if we don’t pay attention. And life’s too short not to pay attention. It is that time of year, when cosying up on the sofa with yarn and needles is the perfect activity for increasingly frosty days. The cream-coloured socks were a request from Emily, and will be added to her Christmas stocking in a few weeks. I can’t believe that time is creeping up already! I thought I would still be knitting them at the last minute, but because they’re made of a thicker wool they were a lot quicker to knit up than I anticipated. I do enjoy knitting socks. I like using the double-pointed needles. I like that you can watch them forming completely before your eyes as you knit, with no fussy making-up to do afterwards. I’ve already started on this bright multi-coloured self-striping pair… this time for myself. 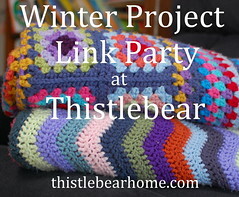 I am linking this post with Jenny from Thistlebear, who is hosting a Winter Project Link Party. Do pop along to her blog to see her beautiful rainbow of crochet butterflies, and maybe join in too.